It’s no secret that we Indians love SUVs. We like their rugged looks, high ground clearance and the practicality and space they offer. But you don’t always want the bulk and extra weight of a full-sized SUV. For this very reason, we have seen some interesting developments in our market. For one, manufacturers have started to come up with crossover versions of regular family hatchbacks designed to cash in on the strong, SUV-like visual appeal, without having to design and engineer an all-new car. We now have four crossovers in our market. Skoda and VW explored the niche first with the Fabia Scout and the Cross Polo and then came the Toyota Etios cross. But those cars were just cosmetically enhanced. Fiat’s Avventura, on the other hand, was the first real crossover, that came with a considerably altered and raised suspension. It also came with larger wheel arches to accommodate chunkier tyres and there were significant sheet metal changes as well. Now, Hyundai has joined the fray. The i20 Active, as the name suggests, is based on the i20 hatchback. And like Fiat, Hyundai has made significant changes to its crossover. It comes with more clearance, has bigger wheels, larger bumpers, matte-finish cladding and aluminium roof rails. But unlike the Fiat, which has a tail-mounted spare wheel for even more SUV feel, the Hyundai is a regular hatch. But has Hyundai done enough to get ahead of the Avventura? Slide into the Active’s comfortable driver’s seat and you are greeted by a chunky, leather-wrapped steering wheel and a high-quality dash. The two-tone dash is neat and clean, with no extraneous or over styled features, giving it a mature look. The top part is finished in high-quality, non-reflective black plastic while the middle portion uses blue which may not be to everyone’s liking. The Avventura’s dash, on the other hand, has more flair and the layered design looks very attractive. The addition of the bespoke tilt meter and digital compass dials on top of the centre console add to its rugged appeal. The front seats, though not as comfy as the Active’s, are good enough but like the Punto and the Linea, the driving position is flawed. The steering is placed too high and close to the driver and the high dash means visibility is not that great either. The quality on the upper dash is great with soft-touch bits. But some plastics on the lower half of the dash feel a little low rent and the quality is not as consistent as the Active’s. Move to the rear seat and the i20 Active reveals its greatest strength. In terms of legroom, the rear bench is very spacious and you won’t feel shortchanged like in the cramped Fiat. Even tall drivers can be comfortable behind the wheel without crushing the knees of the rear passengers and the slightly reclined rear bench angle adds to the comfort levels too. The Fiat, on the other hand, feels a size smaller than the Active. However, it’s just the legroom that is a problem in the Avventura. In terms of practicality, there are plenty of storage spaces inside the Active’s cabin. You get one-litre bottle holders in each of the doors, two large cup-holders behind the gear lever, and a cubbyhole for storing your phone just below the air-con controls. Like the spacious cabin, the Hyundai’s boot, at 285 litres, is large and enough for your weekend’s luggage. The Avventura, sadly, has only one small cup-holder up front, tiny door pockets and a small glovebox as well. It does at least have a decent-sized boot, though not as big as the Active’s. Also, accessing the boot is a complicated affair thanks to the tail-mounted spare wheel. Thumb the engine start button on the Active and you are greeted by a refined idle. The 89bhp unit is shared with the hatchback and is easily the quieter and smoother motor. When you take off, there is a bit of a delay in responses below 2000rpm and the wait, at times, isn’t ideal. Owing to this city driving isn’t as effortless as we would have liked but it does feel slightly better than the Avventura. But once power comes in past 2000rpm, there is a strong surge and the Active picks up speed quite rapidly. It feels like there is plenty of power in reserve and as a result, acceleration is quite effortless. In our 0-100kph tests, the Active managed an impressive time of 13.12sec. Out on the highway, the strong mid-range makes it an able cruiser. Since you’re usually in the meat of the powerband at cruising speeds, it responds quite well to inputs to make overtaking easy and fairly effortless. Also, the tall sixth gear adds to the Active’s cruising ability and it helps fuel efficiency too. The Avventura uses the proven Fiat 1.3-litre Multijet diesel engine, pumping out a decent 92bhp and 21.31kgm of pulling power. When you start it up, the motor settles into a gravelly idle. Shift the gear lever into first and you will appreciate the progressive clutch and you’ll also like the way it moves off the line. Although the spec sheet says that it makes its maximum pulling power of 21.3kgm at 2000rpm, you feel this torque come in smoothly only when the engine is spinning closer to 2500rpm. Even driving in traffic is a bit of a chore because of the amount of delay. Wait a bit, let it spin to 2500rpm, and only then will you feel a bit more punch in the mid-range. If you keep the engine boiling, it’s possible to make good progress and flat-out, it feels pretty quick with 100kph coming up in only 13.72sec. 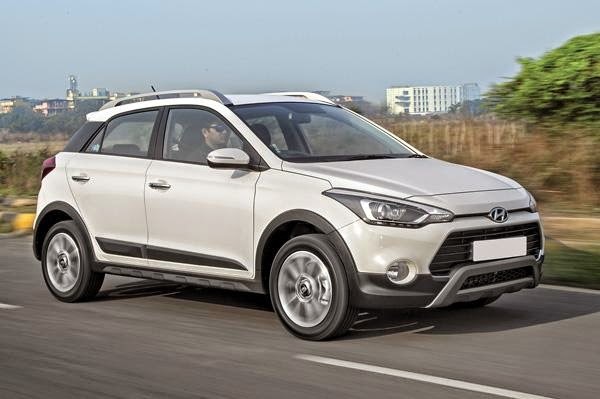 The lightness of the i20 Active’s controls is immediately apparent and, clearly, like most Hyundais, this car too has been designed with ease of operation in mind. 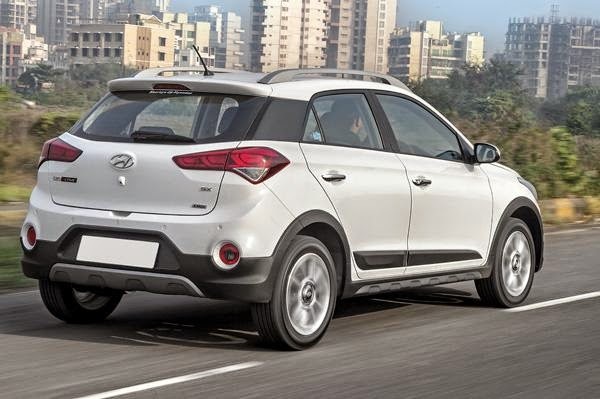 The clutch releases a bit awkwardly but the generously assisted electric power steering and the slick-shifting gearbox make the i20 an easy companion in the urban environment. The car’s suspension deals well with speed breakers and potholes, advantageous on Indian roads and the Active has the better low speed ride. But, as you pick up pace, bump absorption is not that consistent and over patchy roads, the Hyundai’s rear tends to bounce, especially when loaded and there is some body roll too. The light steering, which is a boon in the city, is a bit too light at speed, and there’s an irregularity in the assistance which can be disconcerting. The i20 Active also doesn’t have the ultimate stability of the Avventura and it always feels a little unsettled when you’re going fast. The brakes could be better too as the pedal lacks progressive feel. It must be said that though the Active, in general has issues with the way it handles and rides, the dynamics are quite acceptable for regular driving. 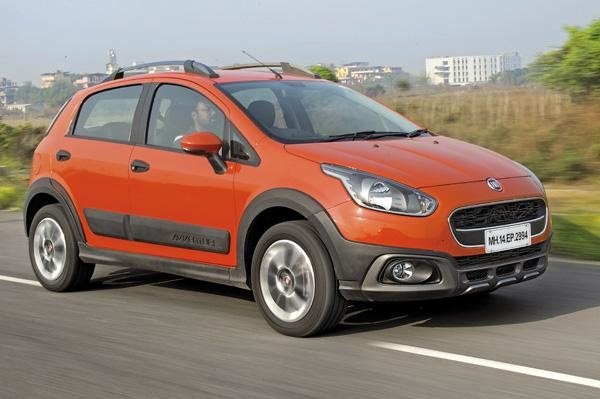 Considering the Avventura is based on the Punto, its great ride and handling prowess doesn’t come as a surprise. It’s the car you can enjoy more, thanks to fantastic grip, accurate steering and grippy suspension. Over any surface, at speed, the Fiat remains unfazed and the refined suspension simply goes about its job keeping you isolated from the biggest of potholes. It’s only at low speeds that you feel some stiffness. With its suspension raised by 20mm, the Avventura does roll a bit around corners but this detracts little from the driving experience. The diesel Hyundai i20 Active, in the top SX trim, costs Rs 8.89 lakh. It is significantly more expensive than the Avventura, but you do get a lot of standard equipment. What works in Hyundai’s favour further is its wide sales and service network and higher ARAI fuel efficiency figures. The Avventura diesel, in this top Emotion spec, costs Rs 36,000 less than the Active SX. Fiat offers the same two years/unlimited standard warranty as the Hyundai but its resale value may not be as strong. Both the Hyundai i20 Active 1.4 CRDi SX and the Fiat Avventura 1.3 Multijet Emotion come equipped with climate control, rear AC vents, leather steering and gear knob, steering-mounted audio and telephony controls. Also, both get safety features like dual airbags along with ABS. 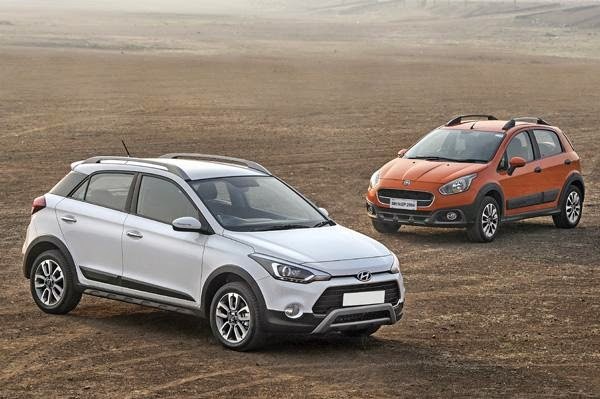 The i20 Active’s steering adjusts for both height and reach while the Avventura’s steering is only height adjustable. Only the Fiat gets height adjustable front seatbelts and an electric boot release button on the dashboard. It also comes with a four-speaker audio system with radio, CD, USB and aux compatibility and Fiat’s Blue and Me system with voice recognition and SMS readout. The instrument console has a digital clock, distance-to-empty indicator, external temperature display, real time mileage indicator along with a compass and inclinometer. The i20 Cross comes loaded with a lot more useful kit like keyless-go, rear parking sensors, rear camera and automatic headlamps. Also, it gets an engine start-stop button and projector headlamps with LED daytime-running lights and cornering lamps. There’s even a gear shift indicator and a four-speaker audio system with two tweeters, 1GB internal memory and radio, CD, aux and USB compatibility. The Fiat Avventura is a great-looking crossover, both inside and out. It’s got huge amount of flair and loads of character, a built-to-last feel and Fiat has improved the engine too. There’s a bit more power now throughout the rev range and, as a result, the Avventura is pretty nice to drive as well. The Fiat, however, loses out for a number of reasons. The driving position is awkward, legroom in the rear is poor, quality on the inside is a bit inconsistent and the engine is noisy, especially in comparison to the Hyundai. It’s a close battle but the i20 Active pips the Fiat in the end. There’s no escaping how big and spacious this car is on the inside, it has the smoother engine, performance is stonger and, being a Hyundai, it’s got more equipment in the cabin. The i20 Active still has some classic Hyundai faults. It doesn’t feel as sorted or as much fun to drive, it has a less-than-perfect ride and in this top SX variant, the Active is a bit expensive. However, you do get a lot of car for the money in terms of its size, practicality, equipment, performance and appeal. And that’s why Hyundai’s i20 Active noses ahead of the Fiat and wins.